After a thorough eye examination, we will discuss the range of options for addressing your eye care needs. Included in these options are eyeglasses. Our doctors are experts in all types of spectacle lenses, which include digital progressive multifocal lenses and digital deskwork/computer lenses, as well as contact lens options, which include rigid, hybrid, and multifocal lenses. Our optical offers a large selection of eyeglasses, designer frames, and sunglasses. We carry the latest European and American designer eyewear collections in a variety of styles, colors, and materials including titanium, stainless steel, and plastic. If you don't have an up-to-date prescription, our eye care experts will examine your eyes to identify your visual needs. With an accurate prescription, our staff will help select the right pair of glasses for your vision needs. We know that everyone has their own unique style, and stock a wide range of eyeglasses and designer frames. We carry the latest European and American designer eyewear collections in a variety of styles, colors and materials, from sleek rimless frames to premium metals to embellished, colorful plastic eyewear. Our opticians have years of experience in fitting eyewear for all ages. We specialize in matching our patients with attractive glasses for great vision and a stylish appearance. Kosnoski Eye Care offers an incredible collection of high fashion, quality eyewear - come take a look for yourself! Our opticians are waiting to show you the latest styles in eyeglasses, and we’ll help you choose the perfect pair of frames to enhance your look and provide crisp vision. We carry a large variety of top designer frames for both eyeglasses and sunglasses. Come to our office to browse our selection. 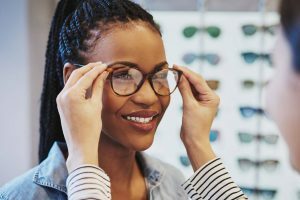 Get tips on caring for your lenses and learn about the benefits of bifocals, prescription sunglasses, and more. An in-depth look at eyeglass lens options, that goes beyond a basic glass or plastic lenses. Women’s eyeglasses have come a long way in the last few decades. Which frame material is right for you? Learn about the different types of metal and plastic and the advantages of each. Multifocal lenses technically refer to any lens that provides more than one zone of corrective power. Visit our interactive online tool and we'll help you choose the glasses that are right for you!